I don't deify technology. But when I buy something electronic (which is rare), particularly if it's expensive, I don't want it to break. 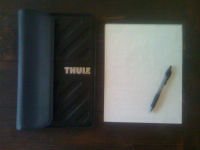 So, when I recently purchased an 11" Macbook Air, I concordantly bought the Thule Gauntlet 11" Macbook Air Sleeve. Durable, yet diminutive: When I bought such a small computer (roughly the size of a standard piece of paper), my desire was that I'd have something small and mobile. The risk here is that it can break easily. So, when I looked for a case, there was a thin line between protective and 'small'. 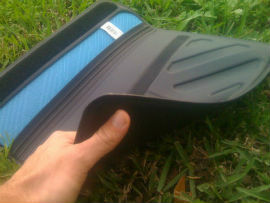 This meets that, with foam padding built into the exterior and additional stiffness to the corners of the sleeve. It takes pressure, but remains effectively concise. Water Resistant: I dance in the rain. I splash in puddles (not always on purpose). I spill drinks. But I don't have to worry too much about the computer being damaged by bits of rain or liquid assaults because the sleeve is welded shut instead of stiched. Water can get in near the top corners, but even then it's gotta travel farther still to get inside - which is much less likely. Padded Lining: The computer slides in nicely and is protected by the Nylex interior. There are other laptop sleeves for the Air series of Macbooks. But, none - in my opinion - are as functional as the Gauntlet series from Thule.